National Aboriginal Day: Friend or foe? 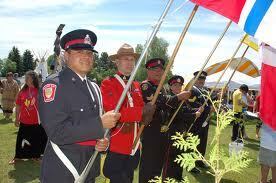 Today, June 21, is Canada’s National Aboriginal Day. This morning, like most other days, I woke up, made my coffee, and sat down to read the news. The consensus seems to be that today is a day to celebrate Aboriginal cultures and to remember our vibrant history within Canada. In the newspapers, stories of celebration and cultural performance encourage all Canadians to learn about us, to let us share our cultures with them, and to celebrate Aboriginals as part of Canada’s strong foundation of diversity. And, like most other days, I also read stories about the ongoing struggles for Indigenous land rights, protection of Indigenous grave sites, and recognition of high rates of violence. Yet I further notice that coverage of these concurrent realities — the celebration and the struggles — seem to be kept very separate, as though they cannot exist together, or are somehow irreconcilable in the minds of Canadians and the federal government. The Aboriginal Affairs and Northern Development website declares National Aboriginal Day as kickstarting 11 days of their “Celebrate Canada” festivities. This spirit of celebration and focus on cultural performance is at the heart of this Day’s definition and vision, which seems to encourage a singular message: that Aboriginal people are welcomed into Canada only as dancers, singers and cultural artifacts. This vision disempowers Aboriginal peoples’ struggles to gain sovereignty, to settle land and resource disputes, and to define ourselves not as subjects of Canada but as citizens of our own nations, on our own terms. Defining our cultural traditions as merely part of Canada’s history takes away their political significance as our systems of law, governance and identity. This is no coincidence, as the federal government would obviously not encourage a day to support the recognition of Indigenous nations as sovereign entities. So what does it mean for us, as Indigenous peoples, to celebrate this day? Are there ways we can re-signify our cultural performances on our own terms, and, in the process, remind Canadians that our songs and dances are much more than just lunchtime entertainment? What does it mean for us to be put on display, without recognition of the struggle it has taken for our survival? Where I live, here on Coast Salish territories, we might remind people that local practices like the potlatch were banned under the Indian Act for over 80 years, and only survived because of the resilience and determination of our ancestors to keep our worldviews and systems of governance alive. The dances and songs are inherently politically charged, and are part of our identity as survivors of genocidal policies. These histories cannot be separated from our cultural practices — regardless of the government’s attempts to reframe and recast them as celebrations of Canada’s multicultural history. Many Aboriginal organizations and communities use this day as an opportunity to showcase the strength and resilience of Indigenous youth and elders, focusing on their success, agency and vibrancy. In this way, I suppose we might look at redefining National Aboriginal Day in terms that benefit us and our communities. Yet I worry that this only continues to feed into the government message about this day, and the subordinate role we have in Canada’s story about itself as a country without a history of colonial violence. And so, for all these reasons, I will not be celebrating Canada’s National Aboriginal Day today. Rather, I will do what I do every day: putting my energy into cultivating the strength, resilience and beauty of our Indigenous communities, and doing so for ourselves, on our own terms. I will try to cultivate understanding and education among and between non-Indigenous and Indigenous peoples. I will continue in my efforts to build networks of support and solidarity for the struggles facing Aboriginal communities, all in order to create a brighter future for the generations to follow. And I will give thanks to my ancestors for keeping our cultural practices alive despite the government’s attempts to squash them — initially through the Indian Act, and now through the stripping away of these practices’ political significance. National Aboriginal Day is no friend of mine. Only when every day becomes a day for the recognition of Indigenous self-determination, and the simultaneous recognition of the harms of colonialism, will I ever be able to truly celebrate.